Daisy’s Holiday Cookbook Is Out In Stores! ‘Tis (almost) the season for the stress of holiday entertaining! Yes, for many, the joyous span from Thanksgiving through New Year’s Day is marked by days of tireless kitchen labor and nightmares of carving into a beautifully browned turkey that’s still frozen-raw on the inside, accompanied by mushy vegetables, burned rolls, and lumpy gravy that tastes like schoolroom paste. Wouldn’t it be a rare holiday treat to be able to host a delicious gathering with confidence, plus time and energy to spare to enjoy the company of loved ones? Daisy Martinez, star of the Food Network’s Viva Daisy! and author of Daisy: Morning, Noon, and Night, knows how to make holiday entertaining something anyone can look forward to with anticipation, rather than with trepidation. 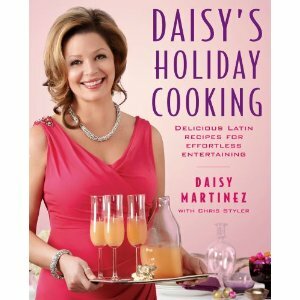 She shares her trusted formula and favorite tasty crowd-pleasers in DAISY’S HOLIDAY COOKING: Delicious Latin Recipes for Effortless Entertaining (Atria Trade Paperback; November 2, 2010; $16.99). Organization, organization, organization! In Daisy’s book, that’s the secret to a successful dinner, brunch, or cocktail party, whether for a guest list of six or sixty. To make getting organized simple and appealing, DAISY’S HOLIDAY COOKING not only offers extremely user-friendly recipes, but also groups them together by menus, ten in all, each with a theme. What’s more, every menu comes with a complete preparation schedule and plenty of tips on what can be made hours, days, or even several weeks ahead of the party without sacrificing quality. · Cozy Festive Fall Dinner for six to quietly savor before the “serious” holiday- entertaining rush. Starting with Velvety Cauliflower-Pear Soup, it features Mushroom-Plantain-Stuffed Chicken Breasts with Mango-Bacon Gravy and culminates with One Cake, Two Ways (Coconut Cream Triple-Layer Cake or “Deconstructed” Tres Leches). · Thanksgiving Buffet for a dozen, serving up Coconut and Winter Squash Soup with Toasted Almonds, Shrimp-Stuffed Zucchini Cups, Corn Bread-Longaniza Sausage Stuffing, and Chilean Mulled Red Wine to complement the Achiote-Rubbed Roast Turkey with Manchamanteles (Chile-Fruit Mole). · Open House Decorating Party with a homey soup-and-sandwich menu for 12, pairing Peruvian Beef Noodle Soup with Venezuelan Pan de Jamón, among other options…and an anytime Cocktail Party for a Festive Season, with an array of savory morsels—Crispy Potato-Cabrales Wontons, Tuna Picadillo in Crisp Cucumber Cups, Chipotle-Pork Meatballs, Frita Sliders, and more—to serve 20. · After-the-Gift-Giving Breakfast to feed six, heartily, featuring a pair of quiches (Pisto Manchego, “a Spanish version of ratatouille,” says Daisy, and Potato, Fig, and Blue Cheese), stacks of “virgin” Coquito Pancakes with Fruit Salsa, and steaming cups of Daisy’s Abuela’s Hot Chocolate made with coconut milk. · Elegant New Year’s Eve Dinner for six, starring Lobster with Sherried-Shallot Béchamel, accompanied by Yellow Coconut-Serrano Rice and Sofrito (an aromatic mix of onions, peppers, hot chiles, herbs, and tomatoes) and toasted with “Cherimoya” Feliz, a refreshing Latino twist on the champagne cocktail. Along with covering everything that goes into every recipe, including explanations of specialty ingredients and step-by-step demonstrations of techniques, for every menu Daisy offers time-saving tips, ideas for “luscious leftovers,” easy variations, creative serving and celebration suggestions, and engaging insights into Latino culinary heritage. This season, there’s no need to fear or dread holiday entertaining. With DAISY’S HOLIDAY COOKING to guide and inspire, every host can minimize last-minute kitchen duties and join in the fun of creating memories while delighting and impressing friends and family members. Daisy Martinez was born to Puerto Rican parents in Brooklyn, New York, and grew up in a household filled with a large, loving extended family and a diversity of delicious Latin food. An actress and model before following her passion into the French Culinary Institute, she launched her career in the food world as a prep-kitchen chef on the set of Lidia’s Italian-American Kitchen. She soon became the host of her own PBS series, Daisy Cooks!, and her cookbook based on the show won the title of Best Latino Cuisine Cookbook in the World by the Gourmand World Cookbook Awards. She currently stars in Viva Daisy!, which debuted on the Food Network in January 2009. Also the author of Daisy: Morning, Noon, and Night, she has been featured in The Washington Post, Reader’s Digest, and AARP VIVA, among other publications, and has appeared on the Today show and The Early Show. Dedicated to her family, Daisy lives in Brooklyn with her husband, Jerry, and their four fantastic children.